Despite the strength and persistence of the winter of 2014, the polar vortex and the Alberta clippers have not deterred the management of Willow Glen Golf Course at Great Lakes from planning ahead to the opening of the 2014 golf season and for improvements to their course. Being situated on the grounds of the Great Lakes Naval Training Center, Willow Glen Golf Course is generally regarded to be ‘military golf course’. The course is operated by the Morale, Welfare, and Recreation Department of the U.S. Navy; still, Willow Glen is open to the public. 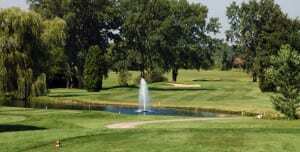 Willow Glen is an 18-hole, par 71, layout featuring two creeks, five ponds, 47 bunkers, and more than 50 willow trees to provide a most effective challenge for golfers. There are four sets of tees measuring 6637 / 6184 / 5512 / 5006 yards. A full flight, all grass station, driving range with six target greens provides an excellent warm-up or practice opportunity. Other golf amenities at Willow Glen include a 9,000 square foot practice green and pull carts and riding carts for rental, and Buckley’s Restaurant — a bar, grill, and full service restaurant.